Coconut milk and chorizo? Oh yes, I did. Scroll me to the recipe! We are starting to get to the bottom of the barrel in our meat cooler, which means we are starting to get tired of a few things. Like the chorizo. So let me tell you what’s gonna happen. We are tired of the chorizo, so we probably won’t order much (if any) this season and then we will wonder why we didn’t get any chorizo about this time next year, when we are tired of whatever else we got too much of. Needless to say, I have definitely reached the “what the eff else can I hide this chorizo in?” point. It happens. Meanwhile, I’d been making this coconut braised chickpea thing like it was my job. You see, El Gallo decided that if he gave up grains (except for beer. clearly beer doesn’t count right?) it would make him run faster for the race he’s training for. So chickpeas + sweet potatoes has made for some pretty damn delicious grain-free running fuel. Yes, you are allowed to make fun of my very skinny husband for adopting a paleo diet (except for beer). Please do. But I digress. So I’m thinking about my chickpeas in coconut milk, and looking at the chorizo, and thinking “Shall I do it again? Shall I ruin a perfectly lovely vegetarian recipe by hiding venison in it?” The answer: meh, why not. Followed by: “And what is that chorizo spice going to be like in coconut milk?” The answer: actually pretty awesome. The warm clovey goodness of the chorizo coupled with the richness of the coconut milk makes for some very eclectic comfort food, and the tang from the tomatoes and lemon cuts right through it and brightens everything up. So here you have it: a dish that doesn’t really belong to any one cuisine because it’s not really Mexican, not really Thai or Indian, and only American in the sense that “American” kind of means a blend of everything sometimes. Heat a large pan over medium heat. Add the chorizo and sauté until cooked through. If chorizo is really greasy, remove with a slotted spoon to paper towels and wipe some of the grease out of the pan, leaving some to cook everything else in. Add chorizo back to pan. Add onion and sauté until translucent (4-5 minutes). Add the garlic, tomatoes, red pepper and lemon zest and cook for a couple minutes. Add the chickpeas, turn the heat up a little bit, and toss everything around for a few minutes. Add the spinach in handfuls, incorporating it and letting it wilt a little before throwing in the next handful. Once all the spinach is in, add the coconut milk, lemon juice and just enough water for everything to simmer in (about 1/4-1/2 cup - eyeball it). Bring to a simmer, then turn the heat down and simmer for about 10 minutes, until the spinach is wilted and the chickpeas are all cooked through. 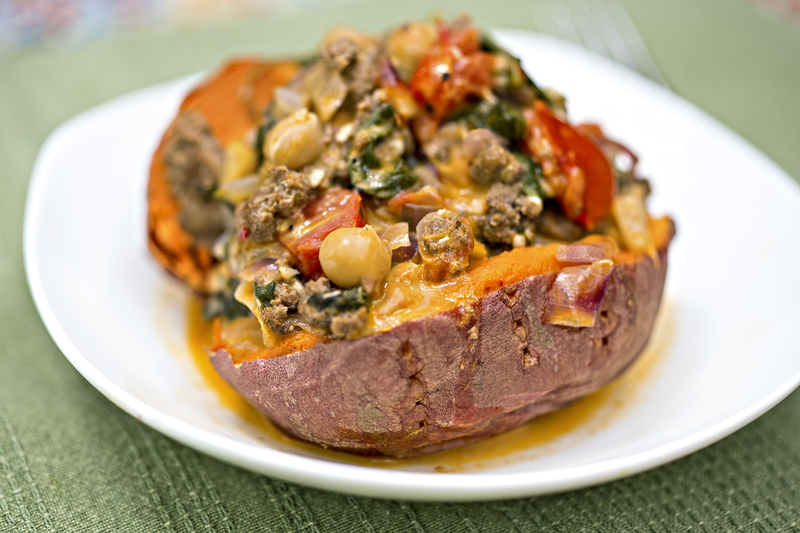 Serve over baked sweet potatoes. 1 Comment on "Venison chorizo recipe: Coconut braised chickpeas with chorizo"
Mmm. This looks yummy. And so easy. And I love the idea of serving it all I a sweet potato boat.